Graco reset indicators from MotionSource keep your machine running while lubrication gets to critical points. 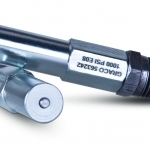 Graco performance indicators pinpoint lube line blockages but allow the lube system to continue to supply lubrication to points that are not blocked. Graco reset indicators with memory reset indicators stop lube system operation when a fault occurs. These devices can be used in either master or secondary divider valves. When a lube line becomes blocked, the resulting high pressure moves pistons and compresses the spring and pushes indicator pin through the opening in the cap. The high pressure prevents the affected divider valve piston from completing its cycle, causing a pressure backup through the divider valve which trips a pressure switch upstream from the valve and shuts off the pump. As the high pressure is relieved, the spring expands, resetting the pistons. The indicator pin is held in place by the o-ring until it is reset manually. This helps you to locate the line that is blocked.